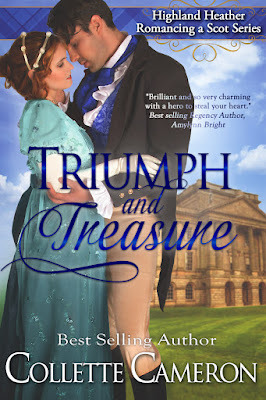 I'm excited to be part of the cover reveal for Collette Cameron's new release Triumph and Treasure. Here's the gorgeous cover, a little about the author, and where she can be reached. When the duke suggests he’ll forgive the debt if Flynn marries his niece, Flynn accepts the duke’s proposal. Reluctant to wed a stranger, but willing to do anything to protect her babe and escape the clutches of the madman who still pursues her, Angelina agrees to the union. Can Flynn and Angelina find happiness and love in a marriage neither wanted, or is the chasm between them insurmountable. Award winning, Amazon best-selling author, Collette Cameron, has a BS in Liberal Studies and a Master's in Teaching. Author of the Castle Brides Series and Highland Heather Romancing a Scot Series, Collette writes Regency and Scottish historicals and makes her home in the Pacific Northwest with her husband and five mini dachshunds. Mother to three and a self-proclaimed Cadbury Chocolate chocoholic, Collette loves a good joke, inspirational quotes, flowers, trivia, and all things shabby chic. You'll always find dogs, birds, quirky—sometimes naughty—humor, and a dash of inspiration in her novels. Her motto for life? You can’t have too much chocolate, too many hugs, or too many flowers. She’s thinking about adding shoes to that list. Thank you so much for helping me celebrate Triumph and Treasure's cover reveal!